Fans of the BBC drama will unite this November in Seattle. "In the year 1878 I took my degree of Doctor of Medicine of the University of London, and proceeded to Netley to go through the course prescribed for surgeons in the army." If you recognize those iconic words as the first line of A Study in Scarlet by Sir Arthur Conan Doyle, you are probably going to like the rest of this post. 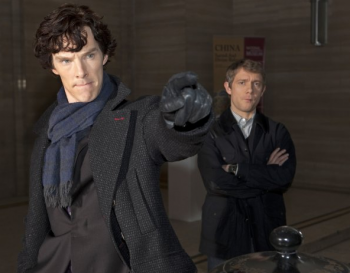 By now, just about every Sherlock Holmes fan (Sherlockian) has seen Sherlock, the lauded BBC adaptation that places the dynamic duo of Holmes and Dr. John Watson in modern-day London. Many of them love the show so much that they've decided to put together its very own convention, which will take place in Seattle, Washington on November 3 and 4, 2012. "The Seattle Sherlock Convention is a celebration of all things Sherlock," write the convention staff, and they mean it. In addition to a full screening of all three episodes from Season 2, the convention will feature mystery board games a cosplay contest, fan films, trivia, and a number of panels. For those with more literary interests, at least one of the panels will focus on the original Holmes canon and how new authors have adapted it over the last century. Since this is the convention's first year, its aims are modest, its guest list is comprised of prominent fans rather than show personalities, and attendance numbers are uncertain. It may not be worth trekking out to Seattle for the Sherlock Convention, but if you're in the area, it seems like a perfect opportunity to pack your Stradivarius and meet some like-minded detectives.